On 18-21 July 2018 took place at the Estonian Academy of Music and Theatre (EAMT) a 4-day workshop with the aim to test how can research and education networks connect musicians in different countries so they can rehearse and perform together. This event was globally first of its kind. Hands-on training gave national research and education networks (NRENs) from Eastern Partnership (EaP) countries practical experience in setting up network connectivity combined with LoLa (low latency audiovisual streaming system). The Estonian Academy of Music and Theatre (EAMT) provided training leadership and technical support, based on the rich LoLa experience that was gained through the 2017 ‘Music Without Borders’ concert organised by EaPConnect and subsequent other events. Around 20 network and sound specialists and musicians from four EaP and three partner EU countries met at EAMT to exchange practical experience and theoretical knowledge, to interact and share best practices in a very dynamic environment. Split into two teams, they simulated being in different countries by setting up network and LoLa connections from two rooms. During this creative technical process they also discussed potential future collaborations to support music master classes and lectures. Each day of training was followed by a rehearsal, with the week culminating in a real LoLa use case – ‘Remote Transitions’, a concert with a live connection between Tallinn and two locations in Italy. 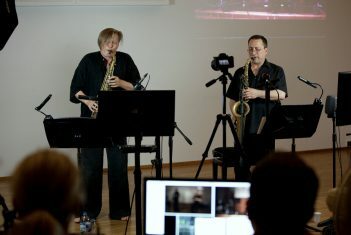 Well-known musicians from Georgia and Germany – Reso Kiknadze and Vladi Bystrov – played saxophones in Tallinn together with musicians in Trieste and a dancer in San Giorgio-Venice, showcasing to an audience in San Giorgio-Venice how seamless a connection the networks and LoLa provide. The Tallinn activities were hosted and facilitated by EAMT. The Italian activities were coordinated with Conservatorio di Musica “G. Tartini” di Trieste as part of an Italian music festival. The Tallinn events were organised by the EaPConnect project in cooperation with the Italian NREN GARR.